In Uruguay, the climate is temperate, with mild winters and hot summers, and quite rainy throughout the year. In most of the country, the average temperatures are similar to those of the Mediterranean coasts, while in the far north they are a little higher. In comparison with the Mediterranean climate, however, here even summer is rainy, although this happens because of thunderstorms, which do not reduce by much the sunshine hours. In addition, clashes of air masses in Uruguay are more intense, and temperature variations are higher than in the more sheltered Mediterranean Sea. Being that Uruguay is in the Southern Hemisphere, the seasons are clearly reversed in comparison with Europe or North America. 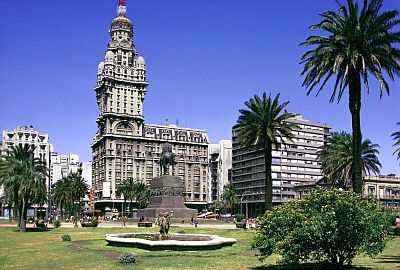 In the capital, Montevideo, the average temperature ranges from 10 °C (50 °F) in July to 23 °C (73 °F) in January. In summer, the heat is tempered by sea breezes (more than in Buenos Aires, which is located on the other side of the Rio de la Plata, but more to the interior). Here are the average temperatures. In the far north, the climate is warmer: in Artigas the average of June and July doesn't go below 13 °C (55.5 °F), while in January it reaches 26 °C (78.5 °F). Annual precipitation hovers around 1,000/1,100 millimeters (40/43 inches) in the south (see Montevideo), while it's higher in the center and north, where it's around 1,200 mm (47 in), but in the far north it reaches as high as 1,500 mm (60 in). Here is the average precipitation in Montevideo: as can be seen in the table, rainfall is fairly constant throughout the year, though there are two relative maxima in autumn (March-April) and spring (October-November). March is often the rainiest month also in other areas of Uruguay, but the highest records of rainfall have occurred often in the month of April. Summer is hot and sunny, though thunderstorms can break out in the afternoon, more likely in the north. Heat waves are possible, with peaks of 38/40 °C (100/104 °F), from December to March in the center and south, and also in November in the far north. Spring and autumn are mild, but the weather is often unstable. The amount of sunshine is good from November to February, while in winter, there are periods of bad weather, when the sky is cloudy, alternating with sunny days. The Atlantic Ocean is a bit cool to swim in, but overall acceptable, from January to March: near Punta del Este it reaches 22 °C (72 °F) in January and March, and 23 °C (73 °F) in February. In Uruguay, the sunniest season is summer (which in the north runs from November to March and in the south from December to February), but it can be hot and has the risk of afternoon thunderstorms. Winter is mild, but sometimes it can be unstable, rainy and windy, especially in the south, and sometimes even cold. Therefore, the intermediate seasons are preferable: autumn (March and April in the south, April and May in the north) and spring (October and November in the south, September and October in the north). Autumn, however, is often more rainy, so we prefer spring. If you do not suffer from the heat, you want more sunshine and maybe you want to spend some time at the beach, you can choose summer. For a beach holiday, summer is clearly the best period, especially January and February. In winter (June to August): pack clothes for spring and autumn, a sweater, a warm jacket, a raincoat. In summer (December to March): pack light clothing, a sweatshirt for the evening, an umbrella or a light raincoat.